Why is it dark under my cupboards (despite the ceiling lamp)? What type of under-cabinet lights are there? How do you install cabinet lights? How do I turn kitchen cabinet lights on? You can find the complete guide and more great tips here. Is the area on the countertop below the kitchen cupboard too dark to chop vegetables? Do you only see a black hole in your pan instead of soup? And does this happen even with your ceiling light switched on? It sounds like you have the classic kitchen lighting problem. Thousands of other homeowners and tenants have the same problem but, luckily, there is a quick and easy solution available: cabinet lights. 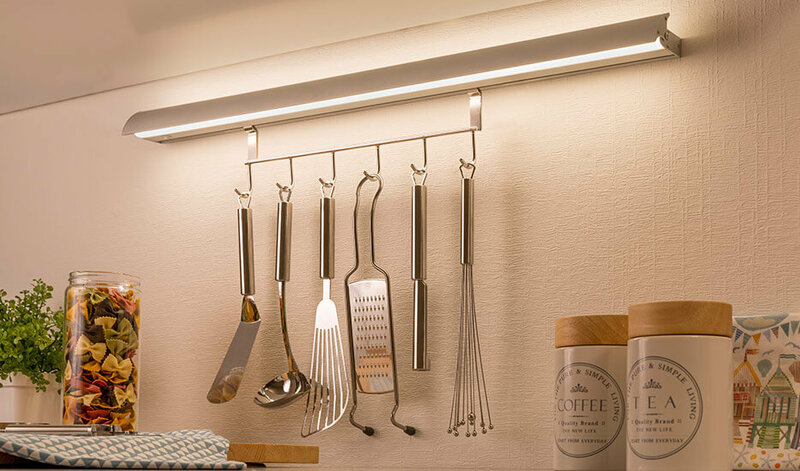 The light from the ceiling simply does not reach the area below your kitchen cupboards. Especially not when you are standing directly in front of the space with your back to the light. Your body creates a shadow and this shadow falls on the countertop and cooker and makes your life even more difficult. The only solution: create more light, ideally directly below the kitchen cupboards. There are two kinds of cabinet lights: batten lights and spotlights. 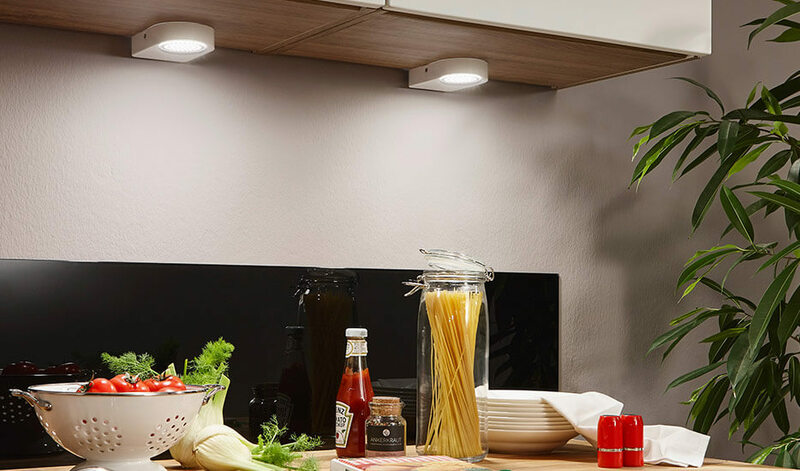 These lights are popular because they emit even lighting across a large area (so you can use all of your hobs and not just one). They can be used outside of the kitchen too, for example above a workbench or in bathrooms, in the form of mirror lights. Important: pay attention to the area of application! Areas that are exposed to moisture (this includes bathrooms and the area around the kitchen sink) must have appropriate moisture protection. You can find this information under “IP code” on the product page. These are generally sold as a set. They offer good lighting for an area when placed close together. Another benefit: if the area is fairly small, e.g. 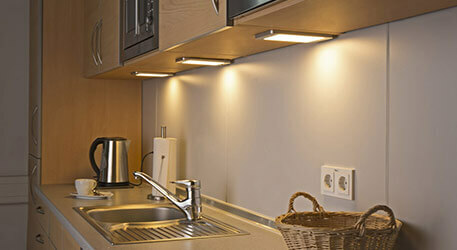 a small kitchenette in a one-bedroom apartment, you can use fewer spotlights. Many sets feature individual spotlights connected together by a plug connector. 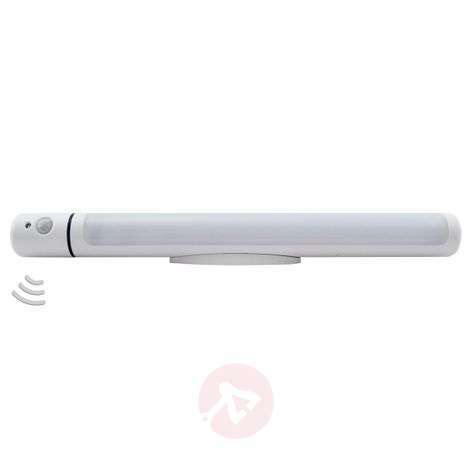 This in turn connects to the power cable (either for an electricity connection or as a plug for a power point). The good news: a set like this only needs one electricity connection (regardless of the number of spotlights)! Not sure whether the product you have chosen would work? Get in touch with our team of experts. They can not only tell you whether it would work as you imagine but can also suggest alternatives if needed. Interested? Telephone: +353 1 699 2138 or use the contact form. 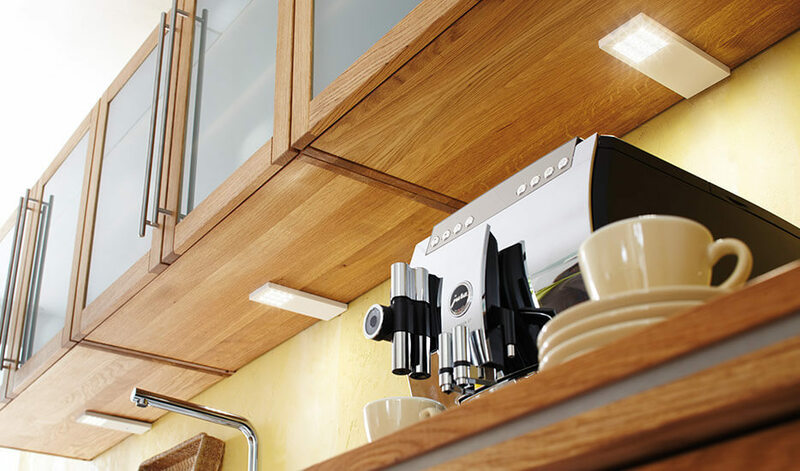 Under-cabinet lights can be powered by mains electricity, with a plug or by batteries. The latter has the great advantage that you don’t need to bother with any cables during installation. Meanwhile, LED lighting technology means that changing the batteries is reduced to a minimum. LEDs are gentle on the battery but will brighten up your kitchen sink a treat. A lovely alternative if you don’t have an electricity connection and can’t get one installed – for example in a rented apartment. You will need to consult the assembly instructions for the product in question, but most products are affixed underneath the cupboard using small screws. Yes, this does mean that you will need to drill small holes in the kitchen cupboard. If you don’t want to do this, you can try using high-quality double-sided adhesive tape. 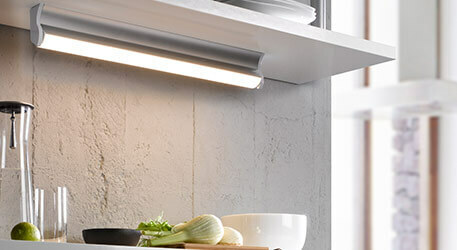 Most under-cabinet lights are very lightweight. Good-quality adhesive tape is often strong enough in this case. But be sure to try it out properly first, otherwise the light might suddenly fall down. 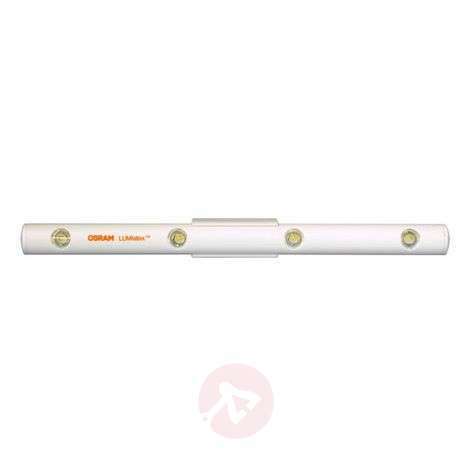 A different option: batten lights for wall installation. Strictly speaking they are not under-cabinet lights, as they don’t hang below the cupboard, but they are still located under the cupboard! And the light is too. It has never been easy to change a halogen reflector bulb in a light wired in behind the cupboard: you have to turn off the mains electricity and remove the cover first. If you want to make your life easier, opt for lights with built-in LEDs. You cannot change these bulbs but, then again, you don’t need to. This is because, if used for a few hours each day (and who needs any more in the kitchen? ), they will last for up to 30 years. They also have a high switching resilience. This means that you can switch your lights on and off several times in a day. Do you want to use a countertop but have greasy hands and don’t want to leave marks on your light? 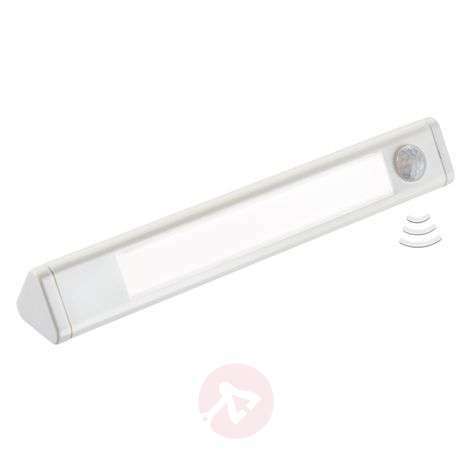 The motion detector will switch the light on automatically as you approach. 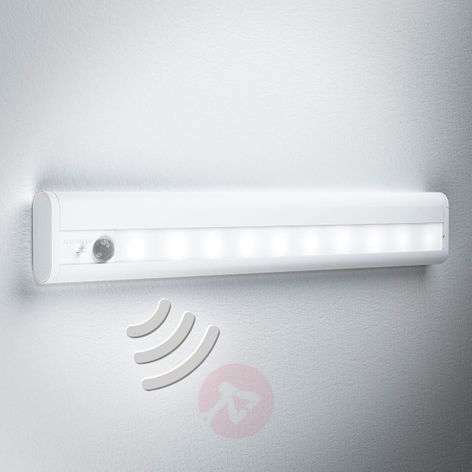 Another added benefit: it will turn off the light automatically too when you are no longer in its immediate proximity. This saves electricity, protects the bulb, increases the service life and is a great solution for anyone who often forgets to turn lights off. No power points in the kitchen? Here’s a great tip! Not got enough power points to plug in your mixer (because you are charging your phone)? Then we recommend cabinet lights with built-in power points. They are integrated into the housing of the light and can be used to plug in other electrical devices. Need more tips or some advice? Get in touch with our team of experts. Simply call on +353 1 699 2138 or get in touch via the contact form .